You can look at old bookcases sold in thrift stores, however this can be a bit challenging to find one or two that would fit perfectly with all your requirements. What size is your mattress? How many bookcase units would you need? How high or low do you want your bed to be? Some people make this step easy by purchasing bookcases from IKEA. It’s more costly than buying from a thrift store, but a new bookcase is still less expensive than a standard bed with storage! Which of the two options is better will depend on your situation. But ultimately building a bed from bookcases is a DIY project with many advantages. It’s space-saving, cheaper than a typical bed with storage and easier to install, disassemble and transport! 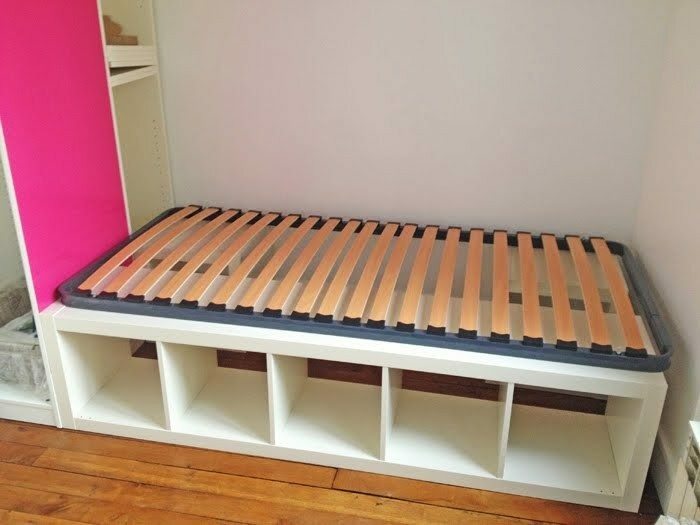 This DIY bed with storage is just perfect for people with small bedrooms and those living in temporary homes. Is this the bed idea you are looking for? Great bed! I am sharing this on pinterest.